Planning on having a bingo night at home? Whether you’re planning a fun night with friends and family, or simply can’t wait for your next bingo fix, our home bingo sets are perfect for organising your very own bingo game! 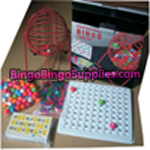 The bingo set includes everything you need to play bingo at home, including a traditional bingo cage, a set of balls, checkboard to place them in once drawn, and of course a book of bingo tickets to play with. The home bingo game set is price at a very reasonable £27.99, which includes everything mentioned above. All the components are supplied in a box making it easy to pack everything away and store once finished, ready for your next home bingo session! Running short on bingo tickets? We can supply additional ones at our usual low prices when you’ve played through the original set, meaning the fun doesn’t have to stop! How about a set of bingo dabbers for the family to play with? We sell a wide range of dabbers and markers suitable for home bingo as well as the hall or club night, including novelty bingo daubers and personalised ones too. Available in strips of 6 or 12 view* with perforations between each booklet. 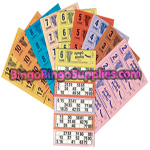 Established in 2003, Bingo Bingo Supplies are leading suppliers of bingo equipment and accessories in the UK. Buy in confidence online from our secure website, or you prefer we can take orders over the phone.